On Sunday I stepped out of my comfort zone and went on a bit of a NYC Adventure. Don't get me wrong... I enjoy going into New York City. There are a couple criteria usually though. If I go into NYC it's usually with Nick. Nick used to work in the city... so he's just at home there. Driving, on the train, hailing cabs, getting in the subway. No problem for Nick. So I just connect myself to him and barely pay attention to where I'm going (other than to gawk a bit and stare in awe at the awesomeness of NYC). The few times I've been into the city without Nick I could probably count on one hand (unless I count the couple times while we were dating that I got on the train alone and he met me at the train station in NYC). 1 - I went with my parents to see the Rockettes Christmas show once (I think). 2 - I went in high school for a band trip (just a day trip). 3 - I went in to meet my college friend Amanda for dinner (I don't remember how I got there... maybe Nick dropped me off??? It might not count.). 4 - I went to BlogHer 2010 (but I actually went with Danielle and then I was surrounded by 2 or 3000 bloggers). 5 - And, I left my iPhone on a cruise ship... so I took a train directly to a cab directly to the cruise terminal to get my phone. Then I walked back to the train station and came home. We live an hour (depending on traffic) from NYC. I never go. I'm just SO adventurous! I drove by myself with Zoe. It was kind of spur of the moment. (I was invited Tuesday evening for Sunday.) We already had Sunday morning plans and afternoon plans. There was no way I could catch a train. I just couldn't say no to this invite. 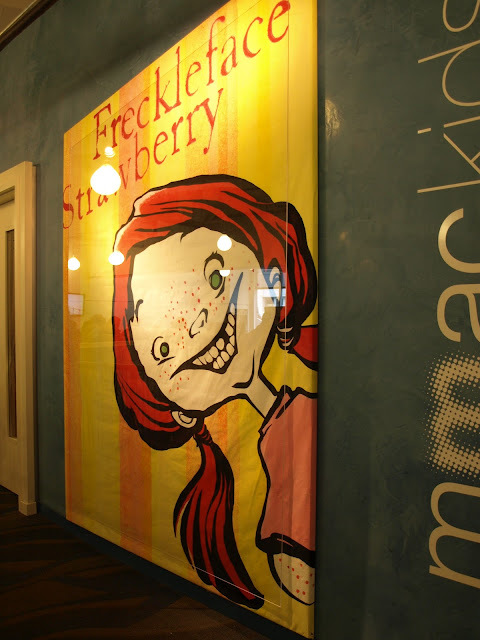 Freckleface Strawberry the Musical AND meeting Julianne Moore. No. Way. So I sucked up my anxiety and nerves and we went. And do you know what? It was SO worth it! And Zoe? She had a blast. It was a nice small theater... and we sat in the 3rd row. After the show Julianne Moore came out with The MOMS to chat and answer a few questions. I don't have a picture, but Zoe and I also went up and asked a question. So... just imagine Zoe and I standing there talking to Julianne Moore (maybe The MOMS will have one to share with me?). Zoe asked if she always liked writing books. She talked about how much she always loved reading but never thought she would write. She also asked if Zoe liked to read and if she liked school. Then I asked how much involvement she had in turning her book into the musical. I was amazed when she said other than giving permission to absolutely go ahead with it... she wasn't involved at all. It really is a perfect extension of the book. I was sure she must have had input. So... bravo to Rose Ciaola (the writer/etc. of the musical) for staying so true to Julianne Moore's writing! Zoe was excited to talk to a real author, especially since they talk a lot about authors at school. Writer's Workshop is a big part of our first grade... and Zoe has been authoring quite a few short "books". I will say I was slightly starstruck by Julianne Moore (oh my gosh I talked to Julianne Moore!!!!) and she was so nice. I was especially impressed by how she took the time to really answers the kids. And Zoe... while she was impressed by meeting an author of a book she likes... I think she was more excited when she got to talk to Freckleface Strawberry and Danny. We had a little after show snack and then we headed back to the car. We listened to our new CD all the way home (because we both decided we couldn't live without one). Unfortunately (or fortunately) there was no traffic heading home, and once again I succeeded in not getting lost... so we didn't even get to listen to the whole CD! I'm pretty proud of myself for actually driving myself into NYC. There will definitely be more trips in the future. 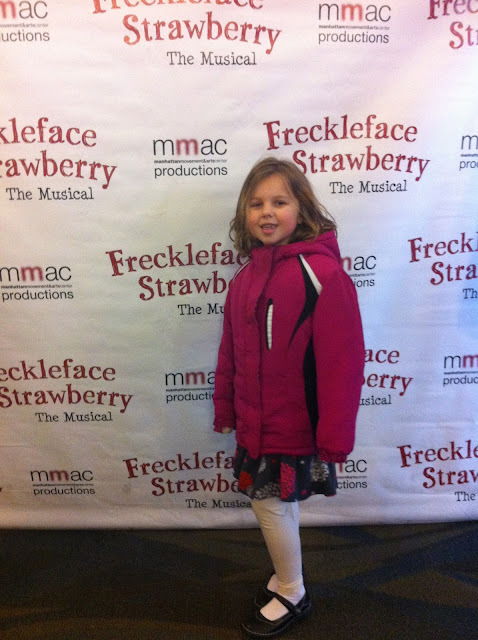 Disclosure: I was given tickets to see Freckleface Strawberry by The MOMS and presented by Target. We were also treated to an after show snack and a gift bag. In return I had to do a shout out on Twitter with some mentions and a hashtag. No review was required. This post was written solely to share my NYC experience and personal thoughts and to tell everyone I DROVE MYSELF INTO NEW YORK CITY!! !